For other uses, see Bayon (disambiguation). The Bayon (Khmer: ប្រាសាទបាយ័ន, Prasat Bayon) is a richly decorated Khmer temple at Angkor in Cambodia. Built in the late 12th or early 13th century as the state temple of the Mahayana Buddhist King Jayavarman VII (Khmer: ព្រះបាទជ័យវរ្ម័នទី ៧), the Bayon stands at the centre of Jayavarman's capital, Angkor Thom (Khmer: អង្គរធំ). Following Jayavarman's death, it was modified and augmented by later Hindu and Theravada Buddhist kings in accordance with their own religious preferences. The Bayon's most distinctive feature is the multitude of serene and smiling stone faces on the many towers which jut out from the upper terrace and cluster around its central peak. The temple has two sets of bas-reliefs, which present a combination of mythological, historical, and mundane scenes. The main conservatory body, the Japanese Government Team for the Safeguarding of Angkor (the JSA) has described the temple as "the most striking expression of the baroque style" of Khmer architecture, as contrasted with the classical style of Angkor Wat (Khmer: ប្រាសាទអង្គរវត្ត). According to Angkor-scholar Maurice Glaize, the Bayon appears "as but a muddle of stones, a sort of moving chaos assaulting the sky." The Bayon was the last state temple to be built at Angkor (Khmer: ក្រុងអង្គរ), and the only Angkorian state temple to be built primarily as a Mahayana Buddhist shrine dedicated to the Buddha, though a great number of minor and local deities were also encompassed as representatives of the various districts and cities of the realm. It was the centrepiece of Jayavarman VII's massive program of monumental construction and public works, which was also responsible for the walls and nāga-bridges of Angkor Thom (Khmer: អង្គរធំ) and the temples of Preah Khan (Khmer: ប្រាសាទព្រះខ័ន), Ta Prohm (Khmer: ប្រាសាទតាព្រហ្ម) and Banteay Kdei (Khmer: ប្រាសាទបន្ទាយក្តី). From the vantage point of the temple's upper terrace, one is struck by "the serenity of the stone faces" occupying many towers. The similarity of the 216 gigantic faces on the temple's towers to other statues of the king has led many scholars to the conclusion that the faces are representations of Jayavarman VII (Khmer: ព្រះបាទជ័យវរ្ម័នទី ៧)himself. Others have said that the faces belong to the bodhisattva of compassion called Avalokitesvara or Lokesvara. The two hypotheses need not be regarded as mutually exclusive. Angkor scholar George Coedès has theorized that Jayavarman stood squarely in the tradition of the Khmer monarchs in thinking of himself as a "devaraja" (god-king), the salient difference being that while his predecessors were Hindus and regarded themselves as consubstantial with Shiva and his symbol the lingam, Jayavarman as a Buddhist identified himself with the Buddha and the bodhisattva. Since the time of Jayavarman VII, the Bayon has undergone numerous additions and alterations at the hands of subsequent monarchs. During the reign of Jayavarman VIII in the mid-13th century, the Khmer empire reverted to Hinduism and its state temple was altered accordingly. In later centuries, Theravada Buddhism became the dominant religion, leading to still further changes, before the temple was eventually abandoned to the jungle. Current features which were not part of the original plan include the terrace to the east of the temple, the libraries, the square corners of the inner gallery, and parts of the upper terrace. The original name for the Bayon is Jayagiri (or "Victory Mountain"). After French occupancy, it was later named Banyan Temple due to its religious significance and Buddhist imagery (the Buddha is said to have attained enlightenment under the Banyan tree). When the local Khmer came to work at renovating Banyan Temple, there was a mispronunciation in Banyan, which was pronounced Bayon. The name then stuck. The Bayon in plan, showing the main structure. The dimensions of the upper terrace are only approximate, due to its irregular shape. A scene from the eastern gallery shows a Khmer army on the march. A scene from the southern gallery depicts a naval battle; this section shows Cham warriors in a boat and dead Khmer fighters in the water. A market scene in the southern gallery shows the weighing of goods; the fish belong to a naval battle taking place above. in the eastern gallery, a land battle between Khmer and Cham forces, both of which are supported by elephants: the Khmer appear to be winning. The outer gallery encloses a courtyard in which there are two libraries (one on either side of the east entrance). Originally the courtyard contained 16 chapels, but these were subsequently demolished by the Hindu restorationist Jayavarman VIII. The inner gallery is raised above ground level and has doubled corners, with the original redented cross-shape later filled out to a square. Its bas-reliefs, later additions of Jayavarman VIII, are in stark contrast to those of the outer: rather than set-piece battles and processions, the smaller canvases offered by the inner gallery are decorated for the most part with scenes from Hindu mythology. Some of the figures depicted are Siva, Vishnu, and Brahma, the members of the trimurti or threefold godhead of Hinduism, Apsaras or celestial dancers, Ravana and Garuda. There is however no certainty as to what some of the panels depict, or as to their relationship with one another. One gallery just north of the eastern gopura, for example, shows two linked scenes which have been explained as the freeing of a goddess from inside a mountain, or as an act of iconoclasm by Cham invaders. Another series of panels shows a king fighting a gigantic serpent with his bare hands, then having his hands examined by women, and finally lying ill in bed; these images have been connected with the legend of the Leper King, who contracted leprosy from the venom of a serpent with whom he had done battle. Less obscure are depictions of the construction of a Vishnuite temple (south of the western gopura) and the Churning of the Sea of Milk (north of the western gopura). The inner gallery is nearly filled by the upper terrace, raised one level higher again. The lack of space between the inner gallery and the upper terrace has led scholars to conclude that the upper terrace did not figure in the original plan for the temple, but that it was added shortly thereafter following a change in design. Originally, it is believed, the Bayon had been designed as a single-level structure, similar in that respect to the roughly contemporaneous foundations at Ta Prohm and Banteay Kdei. The upper terrace is home to the famous "face towers" of the Bayon, each of which supports two, three or (most commonly) four gigantic smiling faces. In addition to the mass of the central tower, smaller towers are located along the inner gallery (at the corners and entrances), and on chapels on the upper terrace. "Wherever one wanders," writes Maurice Glaize, "the faces of Lokesvara follow and dominate with their multiple presence." Efforts to read some significance into the numbers of towers and faces have run up against the circumstance that these numbers have not remained constant over time, as towers have been added through construction and lost to attrition. At one point, the temple was host to 49 such towers; now only 37 remain. The number of faces is approximately 200, but since some are only partially preserved there can be no definitive count. Like the inner gallery, the central tower was originally cruciform but was later filled out and made circular. It rises 43 metres above the ground. At the time of the temple's foundation, the principal religious image was a statue of the Buddha, 3.6 m tall, located in the sanctuary at the heart of the central tower. The statue depicted the Buddha seated in meditation, shielded from the elements by the flared hood of the serpent king Mucalinda. During the reign of Hindu restorationist monarch Jayavarman VIII(Khmer: ព្រះបាទជ័យវរ្ម័នទី ៨), the figure was removed from the sanctuary and smashed to pieces. After being recovered in 1933 from the bottom of a well, it was pieced back together, and is now on display in a small pavilion at Angkor. ^ a b Freeman and Jacques, p.78. ^ a b c Glaize, p.87. ^ Coedès, George (1968). Walter F. Vella, ed. The Indianized States of Southeast Asia. trans.Susan Brown Cowing. University of Hawaii Press. pp. 173–175. ISBN 978-0-8248-0368-1. ^ "9 interesting facts about Cambodia". ^ See Glaize, pp.90 ff. and Rovedo, pp.134 ff., for detailed descriptions of the bas-reliefs. ^ Freeman and Jacques, p.85-86. The Khmer are depicted as having short hair and long earlobes, and as wearing loincloths and little else. The Chinese are identified by their beards, topknots, and patterned tunics. ^ Coedès, George (1968). Walter F. Vella, ed. The Indianized States of Southeast Asia. trans.Susan Brown Cowing. University of Hawaii Press. pp. 169–170. ISBN 978-0-8248-0368-1. ^ Freeman and Jacques, p.85-87. The Cham are identified by their tunics, curved shields, and distinctive crown and scarf headgear. It has been speculated that this scene represents the Cham naval attack on the Khmer capital in 1177. 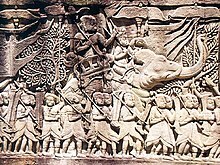 However, since the scene seems to have the Khmer winning, and since the Cham naval attack of 1177 was successful and led to the sack of the Khmer capital, it may be more accurate to say that the scene depicts a subsequent naval engagement from which the forces of Jayavarman VII emerged victorious. ^ Freeman and Jacques, pp.91-92. The subject-matter here may be a revolt documented to have occurred in 1182. ^ Glaize, p.92. Unlike most of the bas-reliefs, this one is accompanied by an inscription, albeit by one that is not particularly helpful. It says, "The deer is his nourishment." ^ Glaize, p.98; Rovedo, pp.148-149 (both preferring the former interpretation). ^ Freeman and Jacques, p.101; Rovedo, p.149-150 (speculating that the serpent is symbolic of the disease itself). ^ Freeman and Jacques, p.83; Glaize, p.87. Coedès, George. Pour mieux comprendre Angkor (Hanoi: Imprimerie D'Extrême-Orient, 1943), esp. Ch.6, "Le mystère du Bayon," pp. 119–148. Freeman, Michael and Jacques, Claude. Ancient Angkor. River Books, 1999, pp. 78 ff. ISBN 0-8348-0426-3. Rovedo, Vittorio. Khmer Mythology: Secrets of Angkor (New York: Weatherhill, 1998), pp. 131 ff. JSA Bayon Master Plan Accessed 17 May 2005. JSA Bayon Symposia Accessed 17 May 2005. Wikimedia Commons has media related to Bayon. Are Ancient Goddesses Actually 12th Century Khmer Queens?